Did anyone else see the newest Finding Nemo movie, Finding Dory? 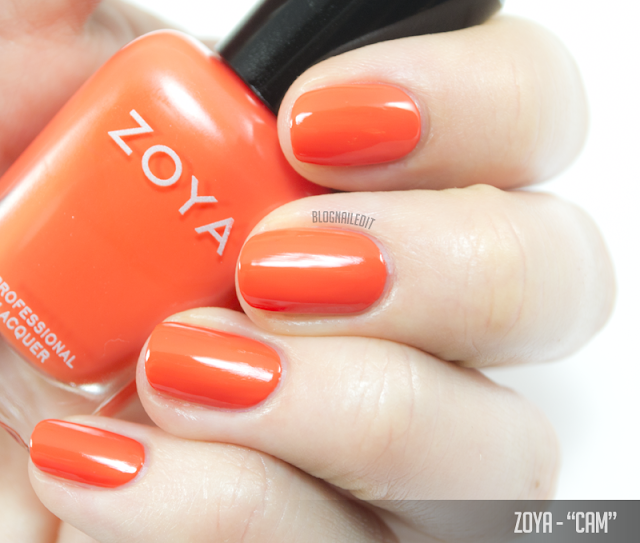 It's fantastic, and adorable, and perfectly suited for Zoya's two summer collections, Sunsets and Seashells. When I saw that one of the Sunsets colors was called Dory and it was a blue, I knew what I had to do for nail art. 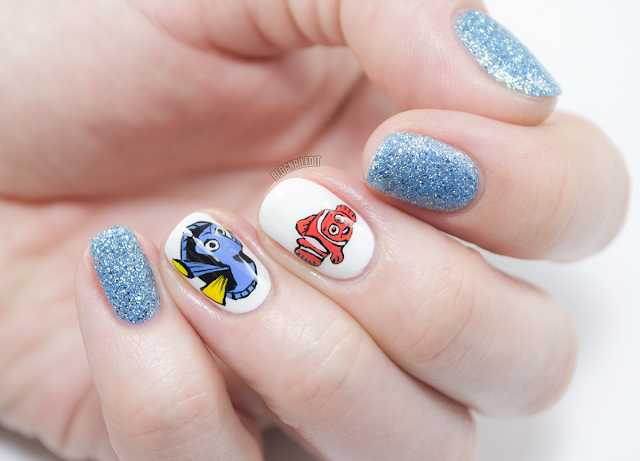 So I did some straight up Finding Nemo nail art! I paired Bay with it, from the Seashells collection. I also used Darcy (another Zoya color), Sharktooth (Jessica Cosmetics), and Into the Further (Duri). This was all done freehand, if you couldn't tell already. I don't think Pixar will be hiring me anytime soon. 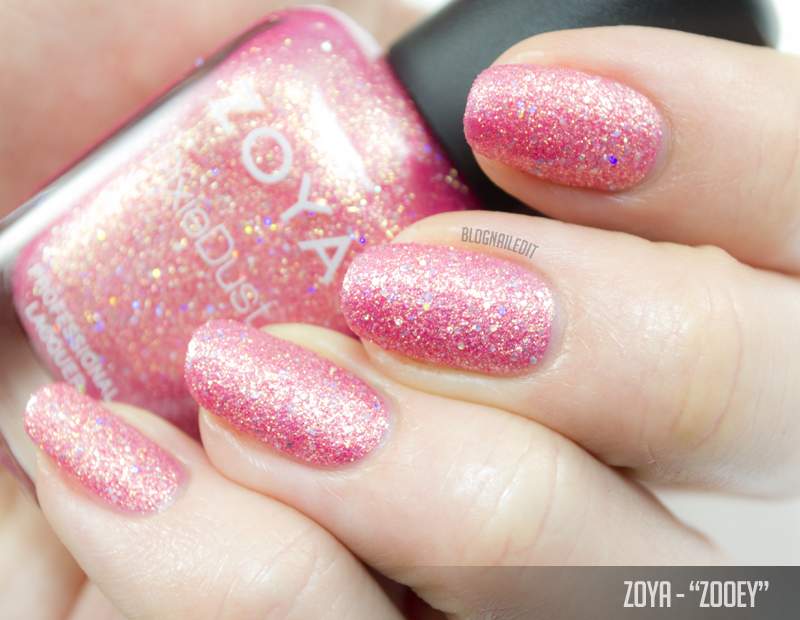 But Zoya hired me...in a way...and sent me Sunsets and Seashells to review for you all, so here are those two collections, all available on Zoya's site here. All of the Sunsets shades are touted as being 1-coat coverage. I mostly agree with that, but you'd need to be careful with the application. To be safe, I did two coats on all these swatches. I also didn't use Seche Vite for the top coat, so these don't look as shiny as my other swatches. I've learned my lesson and will never make that mistake again. Seche Vite for life! 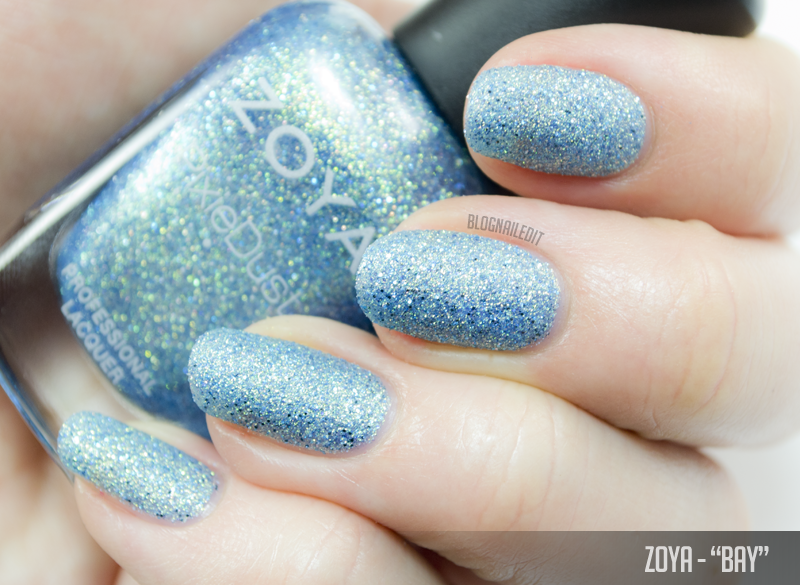 Dory (2 coats) is aptly named for one of the world's most famous fishies. My swatch is a little lighter than it comes out on the nail, but this pretty blue creme is close to Dory from Finding Nemo. Brynn (2 coats) is a bright, cool pink creme. It's like blue and red came together, had a polish baby, then that baby stayed inside all summer and became more pink than purple. Cam (2) burns as bright as the sunset. Great bright orange creme, surprisingly. It's not sheer at all, so it's easy to use for nail art. The difference between Dixie (2 coats) and Brynn up above, is that Dixie is a warmer pink creme, with a little neon. Liv (2 coats) is a purple creme...nothing great. Coverage is great, like the rest of Sunsets, but the color isn't anything special to me. Ness (2 coats) is a bright, mossy green creme. All of the Seashells collection is formulated to be a Zoya Pixiedust. For those of you that don't know, that's a purposely textured polish that's gritty without a top coat, but can be smoothed out with enough coats of a thick enough top coat. Generally though, they're meant to be worn on their own. I've done all the swatches without a top coat to give you their desired look. Bay (2 coats) is a light blue Pixiedust with a little gold glitter. You can see that in the bottle in the picture above. 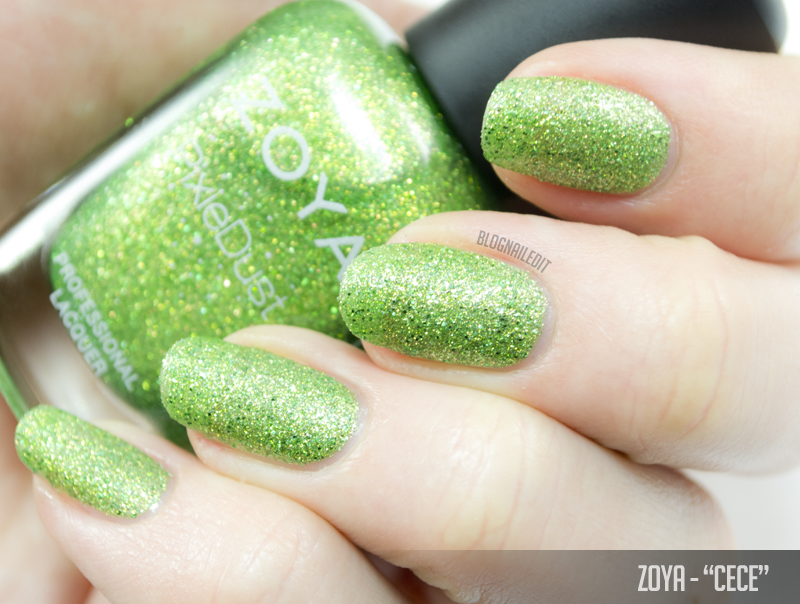 Cece (2 coats) is a really bright and festive grass green glitter. It's going to be a favorite of mine for the holidays, even though it's brighter than typical "Christmas" greens. Levi (2 coats) is white gold with rainbow glitter on top. Very luxe! Linds (2 coats) is interesting, because it looks wet when it's dry! The light red glitter has some goldie-rainbow glitter. Tilly (2 coats) I've named "blue steel" because it's white (like steel) with greyish-blue grit and rainbow glitter. Nothing shows more grit than blue steel. Zooey (2 coats) is probably pronounced like "zo-ee", not as a description for a house with too many animals. It's a baby pink Pixiedust with rainbow glitter, and as girly as it is, it's adorable! 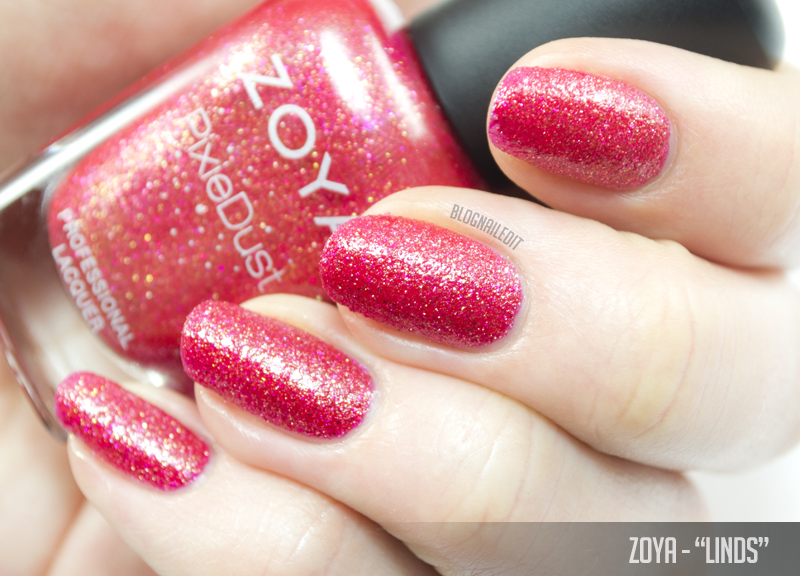 Pick up any of these colors from Zoya's site here. lovely polishes and nail art!